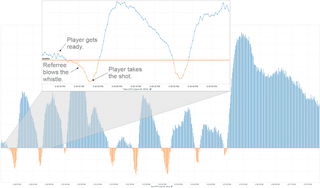 Twitter data's discovered a neat pattern by examining usage during a World Cup shootout. Just like people at a bar or on a couch, everyone gets quiet on Twitter right before each penalty kick. The chart above chronicles penalty kicks in the Brazil-Chile match from June 28, using the rate of tweets per second for all tweets. Twitter data scientists noticed that people stop sending tweets before a kick and predictably send a ton of tweets depending on the outcome. Cherish those moments of silence, people.